Although currently making her life in the “beach” neighbourhood of Toronto, Tanya was born in Montréal, Québec. Educated in the Applied Arts, Tanya has worked as an Art Director, Graphic Designer and arts educator for over 18 years. After reintroducing herself to fine arts through classes at the AGO and the Toronto School of Art over 8 years ago, her passion for painting was re-ignited. A self-taught encaustic painter, Tanya is currently showing and working at a variety of galleries and exhibitions throughout Canada and the US. 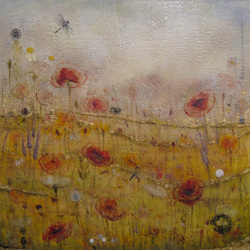 Most days she can be found in her studio exploring the possibilities of oil and wax.